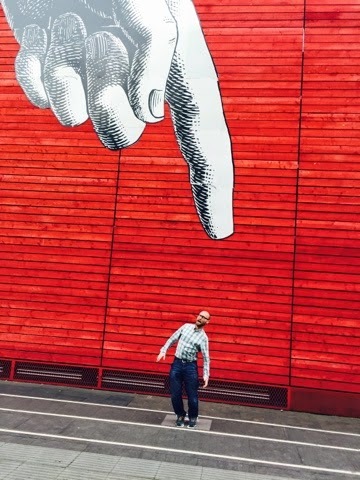 Last Thursday night Stuart and I went to see Everyman at the Olivier Theatre on London's glitzy South Bank. 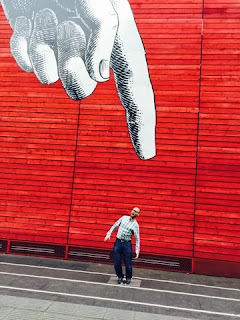 Everyman is the first play to be directed at the National Theatre by Rufus Norris since he took charge. The play stars Oscar-nominated actor Chiwetel Ejiofor as a coke-snorting hedonist who faces death on his 40th birthday. Poet laureate Carol Ann Duffy's reworking of the 15th-century morality play is a seductive spectacle featuring as it does an impressive arsenal of stage effects including a giant video screen, suspended silver statues and a wind machine - along with energetic choreography by Javier de Frutos. Throughout the 100-minute drama, Ejiofor's character Ev meets an array of allegorical characters as he assesses his past life. The drama is foul-mouthed, moralistic, atheistic and theatrical. Kate Duchene plays God as a cleaning lady who opens the play sweeping the floor. The character of Death is played by Dermot Crowley as a dry-humoured Irishman. There are modern references too to footballers, pop stars, and even to a colostomy bag worn by 'Sir Cliff'. Offbeat but traditional, theatrical but heartfelt, it's a triumphant night.